Are you confused when you ask yourself, “How much car insurance do I need?” Did you select the same coverage as what your parents had because, idk it’s confusing as heck? I’m going to walk you through the exact steps to figure out how much car insurance you need. Spoiler alert: you have the potential to save big money so stick around. How much car insurance do you need? I have it covered in this video! This seemed really random to me, but I had four separate conversations within a month about car insurance with my Budget Bootcamp and Freedom Project students. So, I was noticing a lot of students paying more than $100 in car insurance premiums each month. And mind you, most of us aren’t driving BMWs. These are normal cars. Fords, Hondas, Chevy’s. It struck me odd that the premiums were so high. I wanted to give you a break down of how I was able to figure out how much car insurance I needed and how I got my car insurance premium down to just $64 per month. 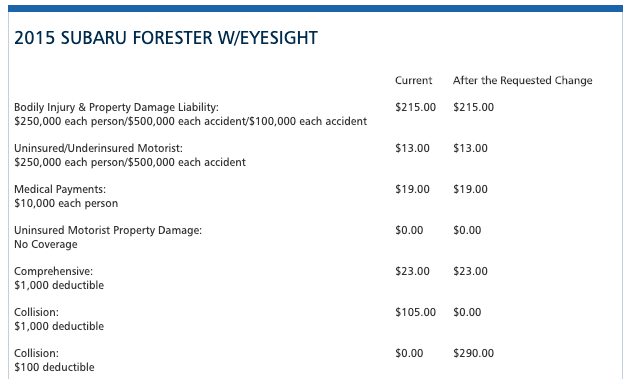 Step 1: Understand the differences between liability, comprehensive, and collision coverage. These are the three most important types of car insurance that you can have. Liability insurance covers any medical or repair costs that someone else might sustain in an accident that is YOUR FAULT. So, the medical portion is called bodily injury liability. The repair portion is called the property damage liability. Comprehensive insurance covers any repairs to your car that did not result from a collision. This would include if something broke into your car, a massive hail storm caused damage, a fire, or a tree branch falling on your car. Collision insurance covers the cost of repairs or replacement of your vehicle if you are involved in an accident. This includes accidents with another car, an object, or yourself. And no matter whose fault it is, your car is protected with collision coverage. Liability insurance does not cover damage to your car unless the other driver is at fault and they have enough to cover the damages to your car. If you have a car loan, you may need full coverage. Full coverage means you have all three types of insurance: liability, comprehensive, and collision. Just because full coverage is required doesn’t mean that you can’t still shop around for the best deal. 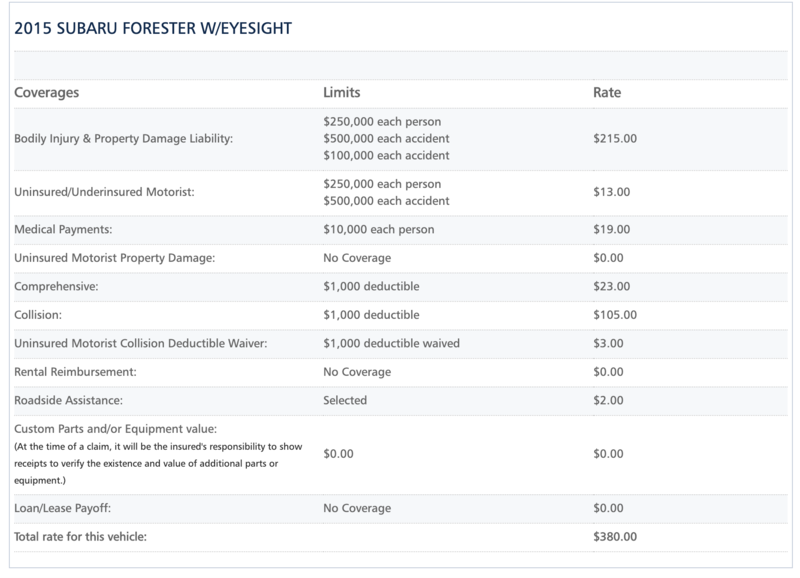 Step 2: Determine how much you need of each type of insurance. Noticed how I maxed out my liability coverage. And you should, too! It doesn’t make that big of a cost difference. As an example, here’s what my premium would look like if I lowered my current coverage from $250/$500/$100 to $100/$300/$50. This is for my 2015 Subaru Forester. My premium would drop $14.78 if I switched within my policy period. But let’s look at the effect on an entire six-month period. It only changes my six-month premium by $20. So, let’s get this straight. Cutting my liability coverage in half only saves me $3.33 per month. For just $3 bucks extra, I can max out my liability coverage and know that I am fully protected. Bottom line, max out your liability coverage. Next, look at your comprehensive coverage. It’s pretty inexpensive to include, so I suggest adding it. Here’s a very important note. If you have at least $1,000 set aside in your Oh Sh!t Fund, raise your deductible to $1,000. My comprehensive coverage costs just $3.83 per month. If I were to experience a theft, for example, I would pay up to $1,000 out of my Oh Sh!t Fund and insurance would cover the rest. This goes the same for collision coverage. Raise your deductible to $1,000 and see what happens to your premium rate. Just for kicks, I took a look at how lowering my deductible would change my rate. Lowering my comprehensive deductible from $1,000 to $100 actually costs me $53 more. This change raises my premium from $380 every six months to $433. That’s a difference of $8.83 additional per month or $106 per year. 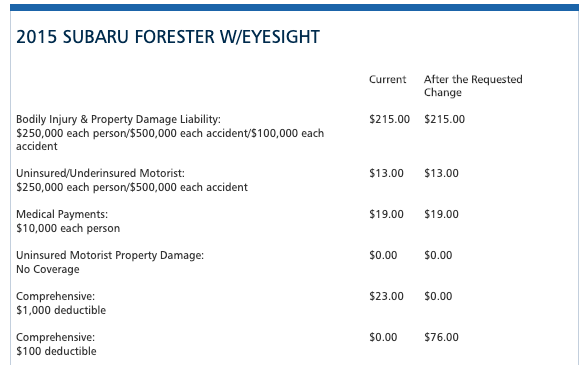 Now let’s see how changing the collision deductible from $1,000 to $100 changes things. Woah. This is by far the biggest swing. By lowering my collision deductible from $1,000 to $100, I increased my six-month premium from $380 to $565. That’s a difference of $370 per year! So, why the big difference? When you opt for a lower deductible on your collision coverage it tells insurance companies that you will take on less risk. If you were to get in an accident, you pay less and your insurance company pays more, thus increasing your premium. If you do anything at all with this exercise, this would be the change to start with. That’s why it’s so important to have at least $1,000 in emergency savings. You save so much money by increasing your collision deductible! Step 3: Get multiple quotes from multiple insurance companies. A great way to save time in getting multiple quotes is to either use a broker or an online service. I recently used a new tool called Gabi. All I had to do was download my existing car insurance policy, upload it to Gabi and let them analyze my coverage. Then they emailed me shortly after and told me I was still getting the cheapest deal with my current provider. The only thing about Gabi that I’m curious about is that they did not show me quotes from leading competitors like Geico or State Farm. I saw Travelers, Nationwide and Allstate. There may be some contracts in place for not showing Geico or State Farm, or maybe they didn’t pop up as a quote for a reason. Step 4: Optimize to see how you can save. A great way to save on car insurance is to bundle with existing services, like renters or homeowners insurance. You can also lower the cost of your monthly premium by paying every six months. My six-month car insurance premium is $380. That is roughly $63 per month. Had I opted to pay every month, I would have paid $72. That’s a difference of $9 per month or $108 per year. What I ended up doing is I budgeted the monthly cost for the six month premium directly into my budget. So, it’s almost as if I’m paying monthly, but I’m really setting aside the $63 in my bank account each month. Then when the premium is due, I pay it in full. Side note: your driving history can impact your premium rate. If you have a history of accidents, generally, your car insurance premium will go up. If you have an older vehicle, your car insurance might be higher than someone with a newer car. For example, my husband drove a 2003 Jeep Grand Cherokee. The car insurance premium was $493 for six months. After six months, it went down to $472. A year later, it was even lower at $448. 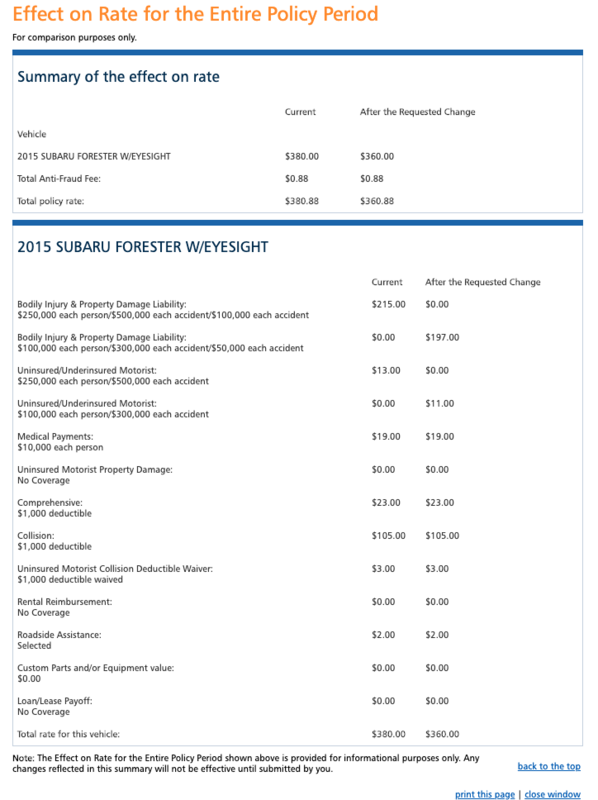 When we bought our 2015 Subaru Forester, our premium changed to $380. Alright, hopefully that helps sort out the question of “How much car insurance do I need” for you! Jump in the comments and let me know if you followed these steps. I’d love to know how much you saved in car insurance!